We recommend and sell all of the Casey Burns flute models. This includes his keyed flutes, and flutes in a wide variety of pitch levels. If you are interested in purchasing one, please contact Grey to learn more and to make arrangements. Grey performs and records with low-pitched Burns flutes in C, B-flat and A (alto). Click below to hear Grey playing a Burns low A (alto) flute on the song If You Say Yes from the CD Cross the Water. You may order Casey’s very popular Folk Flute directly in our online store, without contacting Grey first. The Folk Flute plays beautifully. Its intonation and response are excellent, its tone is wonderful, and it is very comfortable to hold and play. At $450.00 USD, it is an excellent value. It is available in Turkish Boxwood or African Blackwood. Here you may listen to Grey playing a Folk Flute on the Irish reel The Torn Jacket (composed by Connie O’Connell). Here you may watch Grey demonstrate Folk Flutes with both the Standard Ergonomic and the Small-Handed finger hole spacing options. See “Hole Spacing Options” below for full details on these options. When you order your Folk Flute from us, Grey receives a sales commission. This helps support his work in writing flute and whistle instructional materials. Your flute will get to you at the same time, regardless if you order through us or through Casey Burns, and the price is the same. Note: It may take 60-75 days before we can ship your Folk Flute to you. Demand has been quite high. More than 1000 of these flutes have been sold since 2003. What is the Folk Flute, exactly: a three-piece wooden flute for playing traditional music, nothing more, but nothing less. The three-piece design allows rotational adjustment between the left and right hands. The Folk Flute is a solid and correct traditional instrument. It features the same acoustical design as Casey Burns’ more expensive flutes, voiced and tuned with the same degree of care and attention, using exactly the same reamers and processes. The Folk Flute plays just as well as these more expensive models. The bare-bones approach to its design makes the low price possible. Each Folk Flute is unique and will only gain character and depth of tone with age – as will all traditional wooden flutes. 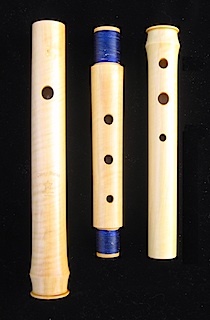 The photo above and to the left shows three African Blackwood Folk Flutes which are, from left to right, Ergonomic Small-Handed, Ergonomic Standard, and In-line Large-Holed Standard. Buy a Folk Flute here. For more information on the Folk Flute, please see Casey Burns’ Folk Flute page.